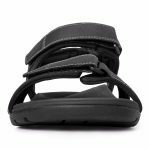 Designed for a little adventure and a lot of support, the Gerrit sandal offers maximum customization and ultimate comfort through three points of adjustability. 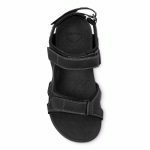 Flexible full grain leather uppers featuring fully adjustable straps with hook-and-loop closure and soft padded jersey liner. Embossed EVA footbed absorbs shock, reducing stress on feet, ankles and knees. 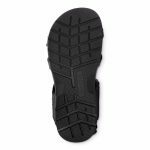 Durable rubber outsole with flex grooves for improved traction.